Cherokee Place Names in the Southeastern U.S.
We here in the mountains of North Georgia live in what used to be Cherokee Indian territory. 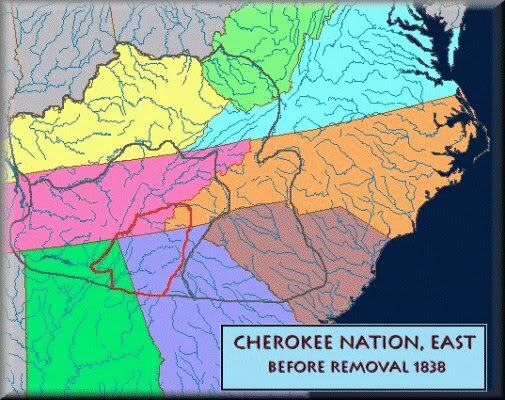 At the time of the Removal, just 168 years ago, the Cherokee Nation’s territory was shaped roughly like a pig’s eye, with one corner near Guntersville, Alabama, and the other at Bryson City, North Carolina. Ellijay [the one in Georgia; there are others, too] was near the eye’s center, and the lands ran from just north of Marietta and Lawrenceville and Gainesville all the way to the Tennessee River in the middle of eastern Tennessee. So, we are not at all surprised [and most of us already know] that a lot of our place names came from the Cherokee language. We tend to take these names for granted, but, to European visitors, they are often unpronounceable and very puzzling. Most Americans have little or no idea what the place names originally meant. And, there have arisen all sorts of false “translations” and colorful and romantic “Indian legends” about some of the names. The great majority of those stories are just not true, sadly. In our mountains, one can’t help feeling the spirit of the old Cherokee Nation in the place names that would seem so exotic to an Englishman, names that are so natural a part of our world here that we give them little thought. Perhaps these articles will give you a glimpse of the ghosts of those who lived here long before the white people ever came. Try to imagine the land as it was only two or three hundred years ago, and then think of the thousands of years that came before that. In all that time, all around where you now sit or park or work or live, Indian people were going about the everyday tasks of living: growing corn and beans, hunting, raising families, loving, telling stories, playing ballgames, sometimes fighting. What stories these mountain places could tell! We can barely touch the surface here, but let us try. We will take a look at some of the place names around us that come from Cherokee, and we will tell the true story behind each one of them. We have to keep in mind that Cherokee is a very, very difficult language for English-speaking people, so it is not at all surprising that the names pretty often got badly garbled in pronunciation. Some quick comments on Cherokee: It has no F, B, V, or P sounds; if a place name has those sounds, it probably did not come from Cherokee.Modern Cherokee has no R sound, either, but one old Cherokee dialect did, so now and then we will find a place name with the R sound. And, Cherokee has one sound that there is no letter in English to represent; because V is not otherwise used, we will use that letter for the sound. About the only time the sound is used in English is when you sort of grunt “Uh-huh” to mean “yes.” So, in giving Cherokee sounds, when I write “v,” you can think of the pronunciation as being like the first syllable of “Uh-huh.” By the way, “V” in Cherokee means “Yes”; it is a sort of nasalized sound. SALACOA: It comes from “Sa-li-quo-yi,” which means “bear grass place.” Salacoa Creek rises in Pickens County and makes its way through two other counties before emptying into the Coosawattee River in Gordon County, Georgia. On that creek, probably near its head, there used to be an old Cherokee village for which the creek took its name. Probably the Indians who settled the village were impressed by some large stand of bear grass that grew in the immediate area. In Cherokee, the ending “-yi” on many words was what we call a locative; that is just a smart-alecky way of saying it means “place.” The same word that is used for bear grass in Cherokee is also used for the green tree snake, maybe because it looks vaguely like a piece of the bear grass. In Oklahoma Cherokee, the word has become “se-la-quo-ya,” and it refers only to the green snake. ELLIJAY: From “E-la i-tse-yi. “The meaning is “green ground place” or “green earth place.” But, that may be subject to more than one interpretation. The “e-la” part is straightforward enough; it means”ground” or “soil” or “earth.” “I-tse-yi” is pronounced in Cherokee about like the sounds you make if you just say the letters E-J-E; it often means “green” in the sense of unripe, and it also means “new.” So, Ellijay may also mean “new ground place,” that is, as at least old-timers will know, a place that has been cleared of trees and made ready for use as a plowed field. The same name was given to many different Cherokee villages, one of which happened to be about where Ellijay, Georgia, is now located. There was another in South Carolina, at the head of the Keowee River; and, another was near what is now Franklin, North Carolina, on Ellijay Creek there. Still another was known to be on what is now called Ellejoy Creek, which feeds into Little River, near Maryville, Tennessee. Another version of the Cherokee words that became “Ellijay” is found down in Hall County: Elachee, as in The Elachee Nature Science Center. From these examples, you will be able to see how names get changed around because people did not really know how to pronounce them correctly. I have noticed that readers are often seeking the modern pronunciation of the town of Ellijay. It is accented on the first and last syllables [EL-li-JAY, or more frequently locally, ELL-uh-JAY]. You will find this article dealing with the history of Ellijay during the period surrounding the Removal to be worth reading. 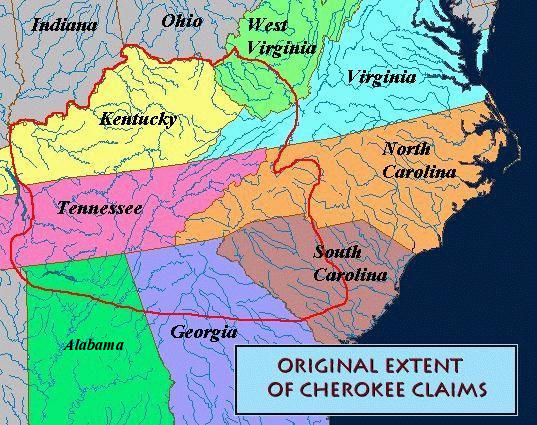 This entry was tagged American Indians, Cherokee lands at time of Removal, Cherokee lands in 1791, Cherokee place names, Elachee, Ellejoy, Ellijay, Georgia place names, map of Cherokee Indian lands, onomastics, original Cherokee lands, Salacoa, Talking Rock. Bookmark the permalink. My greatgreatgrandfather, whose mother was Indian, was born in an unknown part of Virginia in 1802, at a place called Accronita (Or that is how it sounds like it was spelled.) Can anyone tell me where this was? I cannot find any town or place by this name. It sounds like an Indian village or placename. His mother’s name was Sarah Elizabeth Lawrence. His father was David Banks. I stumbled onto your site recently while looking for the meaning of the name of the county I grew up in, Catoosa County. I would say “the Hills” is an appropriate name. Thank you for all your research and sharing your knowledge, I greatly appreciate it. What advice would you give to someone interested in learning to speak and read/write Cherokee. Cherokee counties . . .
How Did Sequatchie Valley Get Its Name?